Welcome to the PGE project! 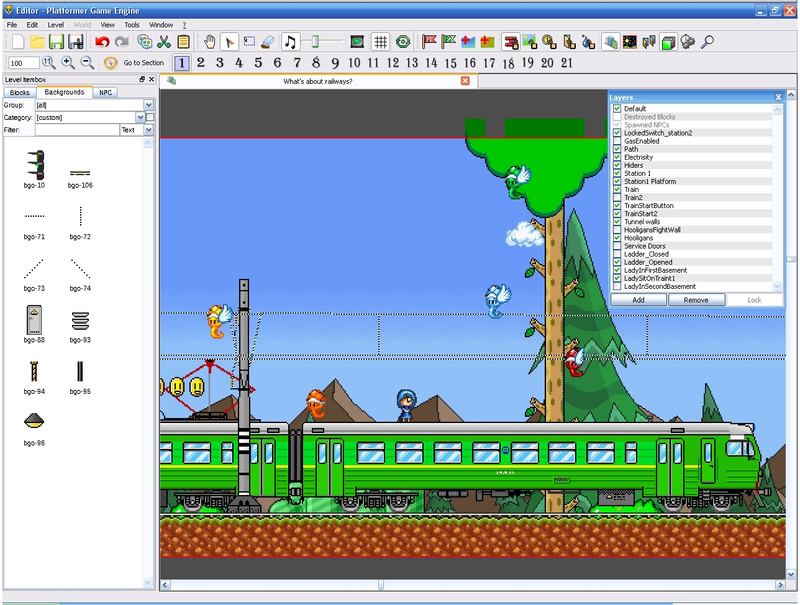 - Download Editor and experimental Engine! So what exactly is this? 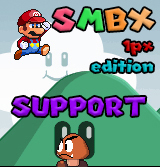 this is a free and open source alternative, advanced and exchanged implementation of SMBX's game engine which 100% compatible with them. 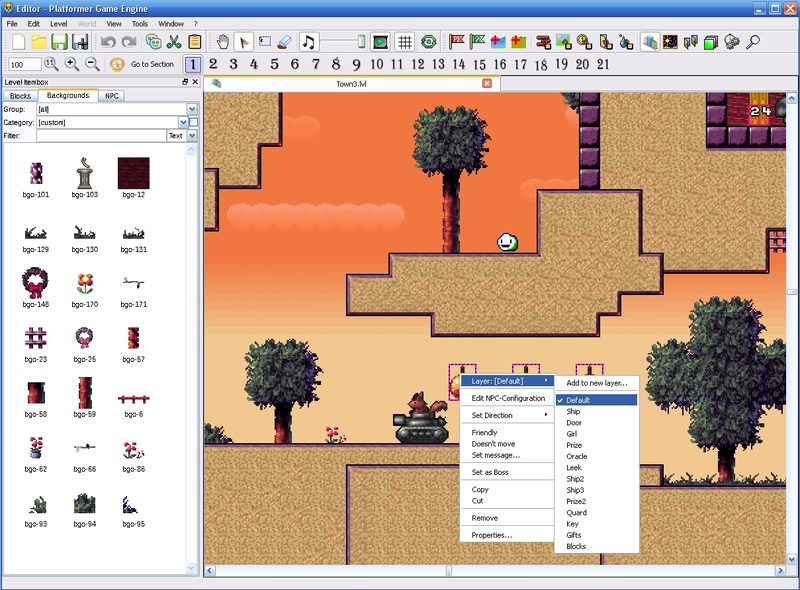 The main parts of it contain would be a game engine and a toolkit for creating games. 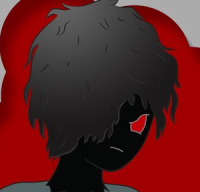 One of the purposes of the project is a giving to SMBX game a new technical platform which should continue SMBX life after abandonment with giving able to add new stuff: new playable characters, new NPC's, new blocks, new BGO, more progressive backgrounds and more freedom with customization. 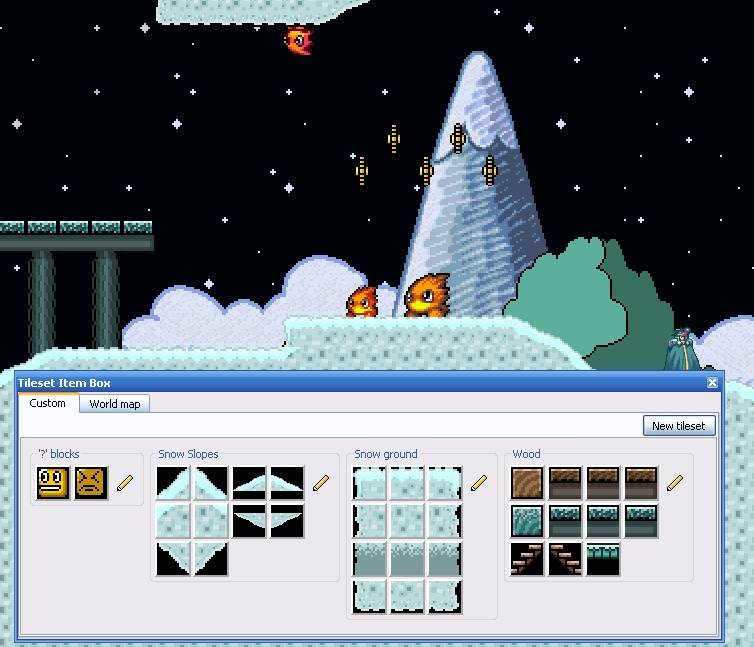 The second purpose is giving able to use this SMBX-like game engine more useful to creating other non-Mario games. I've been working on this project since at least December 2013, and after lots of hours spent in researching of SMBX 1.3 mechanics, I've figured out a way to retain compatibility with SMBX. This, in my opinion, is very significant as there are a lot of episodes and levels made for SMBX out there. 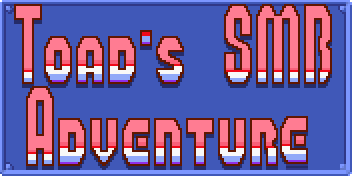 And having a better implementation of that we can open/play/save in the original SMBX64 format is very much in need. I'm quite aware of the fact that VisualBasic (in which SMBX is written) is too slow for the type of purpose SMBX is created for. That's one of the reasons I'm creating my engine in C++ along with OpenGL, which means it should have much more productivity. And with the Qt library, the new engine should be able to have itself compiled on different platforms (such as Windows, MacOS, Linux, etc.). 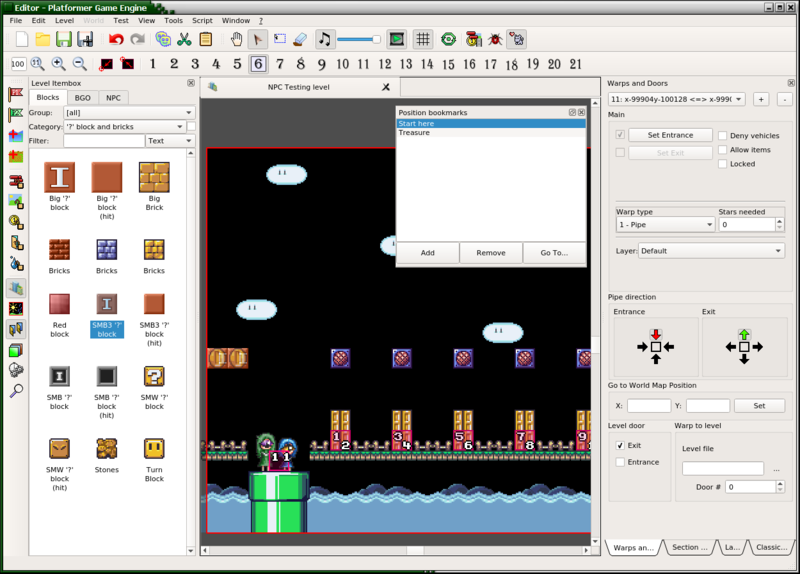 While it would have been ideal if the source code for SMBX was available, we're working on adding support for SMBX via reverse engineering instead. 1) [completed] The reverse engineering phase, which is researching the original SMBX engine, is almost complete. 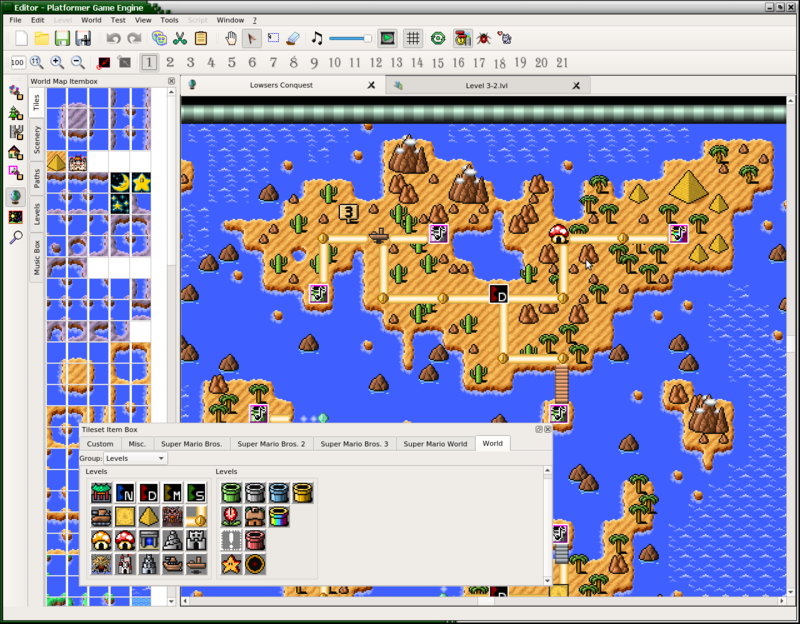 2) [released] Developing the the level/world editor - Periodically I upload updated alpha versions for everyone to test new features and give feedback or report bugs. 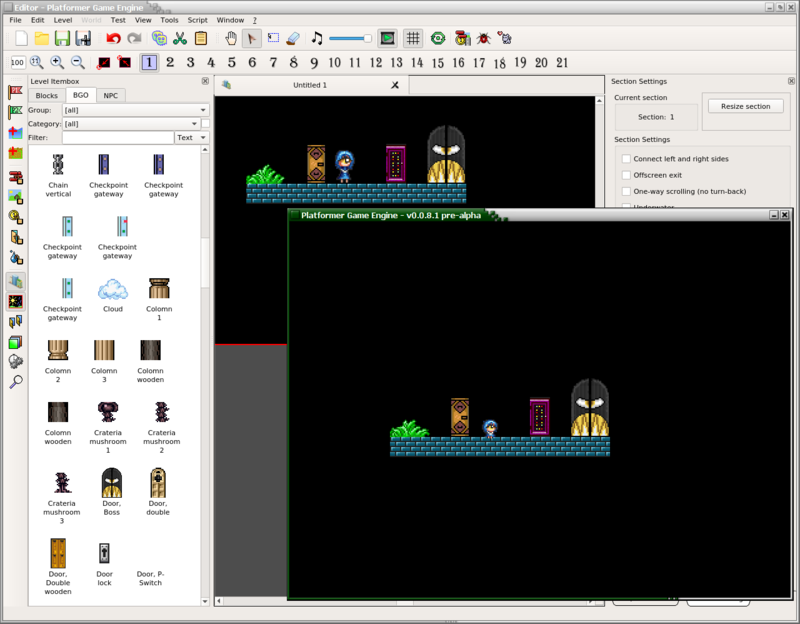 3) [In process] Developing the engine part for play games and allow test levels in the editor. Note: If you looking up for engine controlling, read this text file. In next builds of engine I will add ability to set up custom control keys. Get Online Installer for Windows. Online installer will download and install all necessary stuff automatically! redigitiscool - spawns a dummy message box, doing nothing. Try to type same command in the SMBX engine! wohlstandiscool, kevsoftiscool, raocowiscool, joeyiscool - same as redigitiscool, but with another messages. F12 - take screenshot (will be saved in the 'screenshots' folder which will be in PGE folder or in the %UserProfile%\.PGE_Project). Screenshots will be written into PNG format and will have timedate based filename. F6 - enable slow mode of physical loopsteps. Everything will go slow. Used while collisions are debugged. Don't forget to check this page for updates! Open the configs folder. If it is not exist, create them! Open downloaded archive with config pack and extract contents into configs directory, you must have config subdirectory with installed config pack. PGE - is a codename of project, Project will be re-named into Moondust soon. 2) If some MP3 files don't wanna play, please, check playable by your player, have you all necessary codecs? If you haven't some codecs, please, install them (for Windows systems I recommend the K-Lite Mega pack, or you can install other). 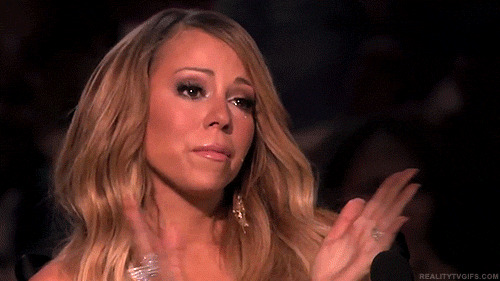 - you also can reconvert to WAV. WAV will be played by ANY players (Only if uncompressed format. If did applied codec, need to install them!). 3) [For PGE Editor 0.2.0 and newer] If music playing is noisy and buggy, please check sample rate of this file (should be 44100 Hz), because all musics to be played in the united audio stream should be re-sampled into uniform sample rate, if sample rate is not same, music will be re-sampled in real time mode. Real-time re-sampling is not good for CPU and can cause noises or wrong playback. Re-sample your music into 44100 Hz and retry to add them into PGE. If the project was pleasant, I invite you to support my project or to join it! Last edited by Wohlstand on Thu Nov 15, 2018 3:26 pm, edited 26 times in total. you still update this? i'll download this. I hope more language in PGE added. andialifbatara wrote: you still update this? i'll download this. I hope more language in PGE added. Yes, I'm updating it sometimes, even I forgot to notify about PGE Engine 0.2.2.1 and PGE Editor 0.3.1.2 with some hotfixes and small improvements. oh yes, yes I guess i should post about this. Wohlstand has "hired" me to create the PGE Manager. I will be coding it in C# but I will be compiling it against Mono similar to the module manager for hopefully compatibility with all OS'es. seems like this is progressing rather nicely. You anyway can push sources to PGE repo (you have a write access ), but put your version of PGE Manager into "Manager.mono" folder ("Manager" is my C++ version which I develops slowly because spending more time to editor and to engine). Don't forget to add .gitignore into your folder or expand global .gitignore. 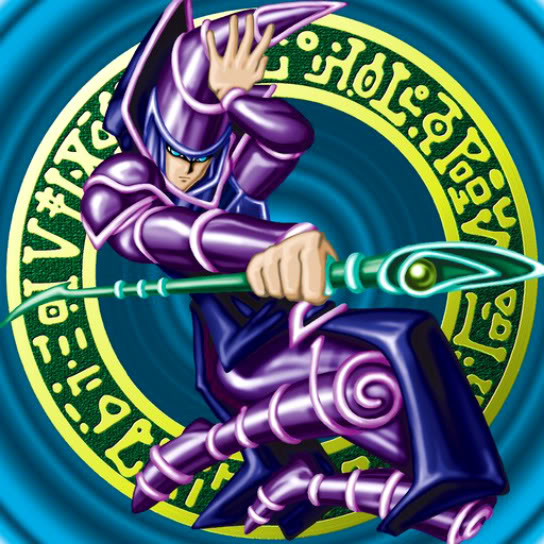 Hey Wohlstand, I meant to ask a while ago, but would it be possible to change the default setting of the Para-Troopas to Jump instead of Chase like in SMBX since Jumping Para-Troopas are generally used more often anyway. It just saves having to change each one if you forget about the default PGE setting. Minor issue, I know, bu thanks anyway if you could alter it. Squishy Rex wrote: Hey Wohlstand, I meant to ask a while ago, but would it be possible to change the default setting of the Para-Troopas to Jump instead of Chase like in SMBX since Jumping Para-Troopas are generally used more often anyway. It just saves having to change each one if you forget about the default PGE setting. Minor issue, I know, bu thanks anyway if you could alter it. Before update: Engine was slightly laggy, turning debug on/off a few times made it smooth, eventually smooth permanently. After update: Engine said screw you, let's go 500+ fps and break speed of light. Oh, and pushed coins by koopa. Loving the fixed editor. ----------A ???? 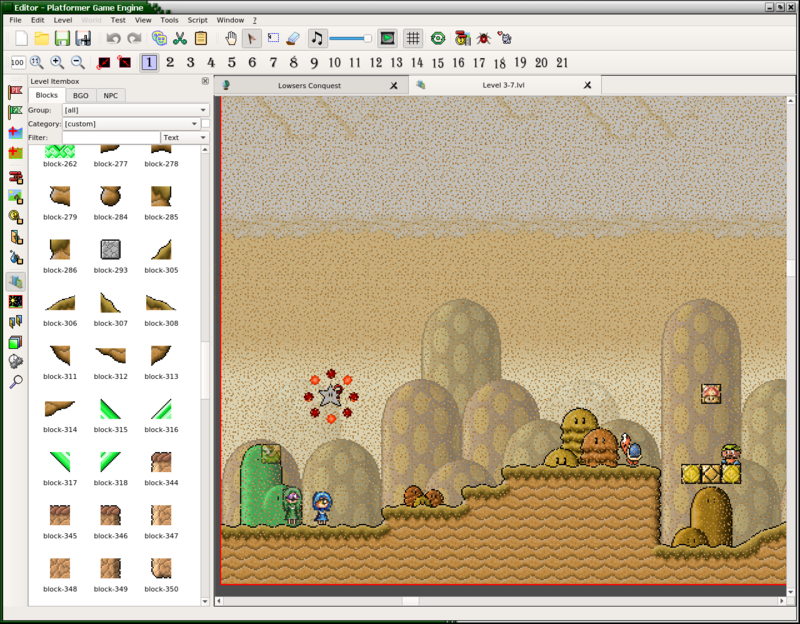 game made in Gamemaker. 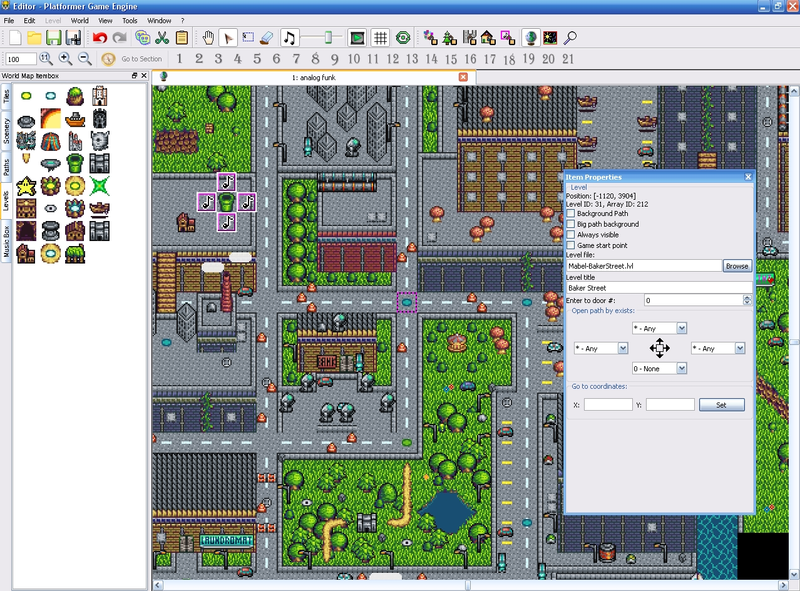 PGE Editor 0.3.1.3 and PGE Engine 0.2.2.2 are available! Download links are in the main post and you can use online installer to automatically update all config packs which you already have. This is a bugfix update with adding of detectors API of NPC-AI which gave ability to have NPC's like thwomps, venus firetrap, boos, etc. With updated fork of SDL2_mixer we now have support of loop points with OGG files (later tutorial will be outed). With this update of modified SDL2_mixer Same update LunaLUA got too! - Stompable NPC's are can be stomped! Does this update have the --version argument? Axiom wrote: Does this update have the --version argument? I love PGE! I can't wait until it's complete and there are alot of Power-ups! Not only a lot of power-ups,but new enemies,characters and THE ONLINE MODE! Prado wrote: Not only a lot of power-ups,but new enemies,characters and THE ONLINE MODE! The online mode is what I think most of us want most!